A soaring Bald Eagle (Haliaeetus leucocephalus) in a clear blue sky. The sky does not get much nicer then this when we photographed this soaring Bald Eagle. Bald Eagles which are also named Haliaeetus leucocephalus by their scientific name are found along the pacific coast of Oregon, Washington, British Columbia and Alaska. 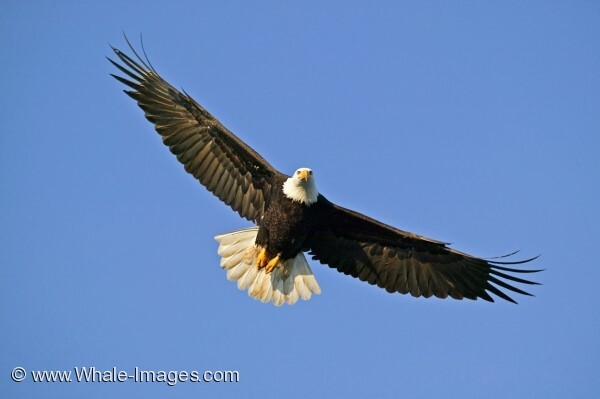 Special bird watching destinations to watch soaring Bald Eagles are Brackendale near Squamish in British Columbia, Haines in Southeast Alaska and Homer on the Kenai Peninsula in Alaska. Picture of a soaring Bald Eagle (Haliaeetus leucocephalus) on a beautiful clear blue sunny day.